Claiming that fracking poses “no significant impact” to the environment, Obama administration officials on May 27 finalized their plans to allow oil companies to resume offshore fracking and acidizing in California’s Santa Barbara Channel. The announcement from the two agencies responsible for oil drilling, the U.S. Bureau of Ocean Energy Management Management (BOEM) and the Bureau of Safety and Environmental Enforcement (BSEE), ended a court-ordered settlement placing a moratorium on offshore fracking and acidizing for oil in the fish and wildlife-rich federal waters off California. 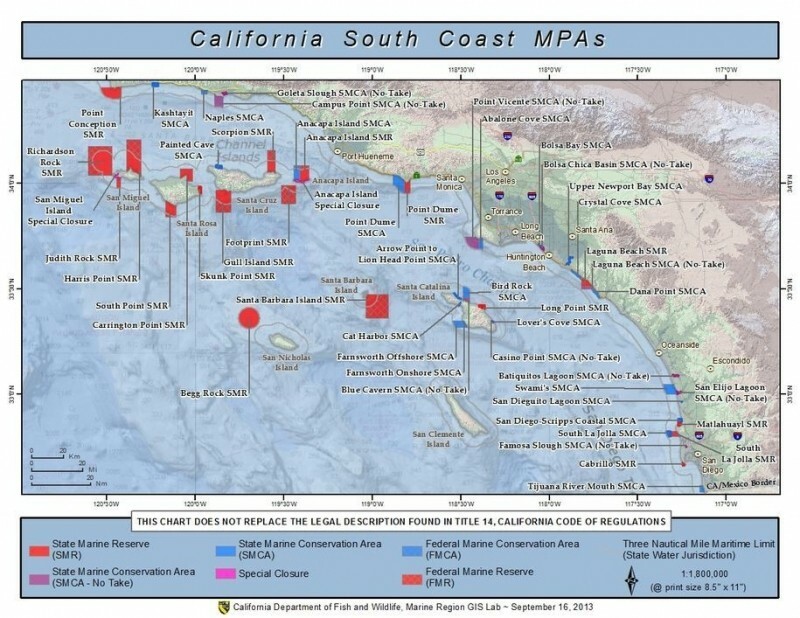 Map of Southern California “marine protected areas” (MPAs) located in both state and federal waters courtesy of the California Department of Fish and Wildlife (CDFW). Catherine Reheis-Boyd President of the Western States Petroleum Association (WSPA), chaired the Marine Life Protection Act (MLPA) Initiative Blue Ribbon Task Force to create so-called “marine protected areas” off the South Coast while oil companies were conducting offshore fracking operations. Fracking presents a threat to fish, wildlife and the ecosystem in both “marine protected areas” and the waters outside of them. State MPAs fail to protect the ocean from fracking, acidizing and other offshore drilling techniques, as well as from pollution, military testing, corporate aquaculture and all human impacts on the ocean other than sustainable fishing and gathering. The two agencies reported they have completed a comprehensive environmental analysis evaluating the potential impacts from the use of “well stimulation treatments” – acidizing and fracking operations — on the 23 oil and gas platforms currently in operation on the Outer Continental Shelf offshore California. Based on the analysis in this joint Programmatic Environmental Assessment (EA), BSEE and BOEM issued a “Finding of No Significant Impact” (FONSI) from the use of specific well stimulation treatments in oil and gas activities on the Pacific Outer Continental Shelf (OCS), according to a joint statement from the two agencies. The EA and the FONSI are available for viewing here. Miyoko Sakashita, director of the Center for Biological Diversity’s Oceans program, vigorously disagreed with the agencies’ finding of “no significant impact” — and warned they may file new litigation to halt offshore fracking. Sakashita said offshore fracking was halted in January after a Center lawsuit challenged what they described as the federal government’s “rubber-stamping “of fracking permits without any analysis of threats to wildlife and ocean ecosystems. According to Sakashita, the case resulted in a settlement agreement that required the Obama administration to stop authorizing offshore fracking and acidizing until federal officials completed a review of the environmental impacts of the practices, required under the National Environmental Policy Act (NEPA). “But today’s finding that offshore fracking has no significant environmental impact glosses over the serious hazards of fracking and fails to answer key questions about the risks of this controversial oil-extraction technique,” she said. Offshore fracking blasts vast volumes of water mixed with toxic chemicals beneath the seafloor at pressures high enough to fracture rocks. “At least 10 fracking chemicals routinely used in offshore fracking in California could kill or harm a broad variety of marine species, including sea otters and fish, Center scientists have found,” she noted. “It’s disturbing that officials charged with protecting our oceans are shrugging off these risks and authorizing oil companies to resume this dangerous practice. The California coast can’t take another oil spill or a deluge of toxic fracking chemicals,” Sakashita said. She said this move paves the way for offshore fracking permits that were previously frozen and the dumping of toxic wastewater directly into the Pacific Ocean where Californians swim, fish, and surf. “It’s clear that Americans want an inspiring new vision for our energy system, with more than half opposed to fracking in recent polling. The president continues to indicate that he is not the person to fulfill that vision. It’s a vision that can only be achieved by keeping fossil fuels in the ground and moving swiftly to a system driven by energy efficiency and renewables,” she said. A Freedom of Information Act and Associated Press investigation in 2013 revealed that oil companies had conducted fracking operations over 200 times off the Southern California Coast over a 20 year period. Ironically, Catherine Reheis-Boyd, President of the Western States Petroleum Association (WSPA), chaired the Marine Life Protection Act (MLPA) Initiative Blue Ribbon Task Force to create so-called “marine protected areas” in Southern California at the same time that oil companies were fracking off the coast. The “marine protected areas” created under her leadership fail to protect the ocean from fracking, acidizing, other offshore oil drilling, pollution, military testing, corporate aquaculture and all human impacts on the ocean other than sustainable fishing and gathering. Leaders of fishing groups, Tribes and grassroots environmental organizations called for the full enforcement of the Marine Life Protection Act of 1999, including bans on oil drilling and pollution in marine protected areas. However, state officials and MLPA Initiative advocates supported only banning or restricting fishing and gathering in these faux MPAs, in violation of the law. Unless new litigation by environmental groups is successful, fracking and acidizing will resume off the California coast — and these unprotected “marine protected areas” may be fouled by fracking wastewater discharges or a big oil spill resulting from an accident off one of these offshore oil rigs.